The Hunter is reeling from the events of Darkblade Assassin. The revelation that he is a Bucerlari, a half-demon immortal, and that every time he kills with his magical weapon Soulhunger it feeds the rebirth of the Destroyer. Vowing to never kill, to never feed the or give into his demonic nature, he flees Voramis to find answers to his forgotten past. How is he really? And who is the mysterious Her that haunts the edges of remembering? Struggling against both his demonic nature and his blades need to constantly kill and feed on the souls of its victims, the Hunter falls in with a female knight and her apprentice. Sir Danna and Visibos are traveling to the city of Malandria, a place where the Beggar God’s temple dominates. For they are both knights of the Beggar God. Knights charged to eradicate demonkind and their offspring—the Bucerlari. The Hunter walks a tightrope with his new companions. He cannot arouse their suspicious or they will turn on him. His only choice is to hope they don’t and slip away? But will he? And what answers will he find in Malandria? 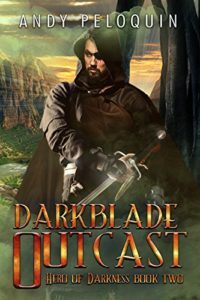 Darkblade Outcast is an excellent follow-up to Darkblade Assassin. The Hunter’s struggle with his demonic nature and the need of the blade are powerful. He doesn’t want to kill, but the world is not so kind to him. Bandits, a cabal of Mages, assassins, and more plague him as he struggles to understand his place in the world and defy his heritage and purpose. He might be destined to help bring back the Destroyer and end the world, but can he defy it? Peloquin creates an interesting world with fascinating characters and dark setting. The journey of the Hunter is fascinating as he goes from assassin to hero. As he learns whether he is an evil man or if he can choose to be good as he struggles with his “addiction” to murder. The need burning inside him, always eating at his self-control, demanding he stop showing mercy. He stop showing compassion. It would be so much easier if he just killed his enemies after all. I am very interested in where Peloquin takes the series next. If you’re a fan of Grimdark Fantasy and compelling characters, than support this well-written, exciting, page-turning indie fantasy! You will be missing out otherwise! You can buy Blade of the Destroyer from Amazon. Check out Andy Peloquin’s website, connect on Linked In, follow him on Google Plus, like him on Twitter @AndyPeloquin, and like him on Facebook.